HPC Medical Products is the industry leader in microdiameter wiring and tubing products for catheter assemblies and medical devices. The company manufactures uninsulated and insulated fine and ultra-fine wire as well as polymer tubing and coated hypo tubing. Tubing products include: reinforced, thermoplastic , polyimide, hybrid , lubricious , and particle composite tubes. 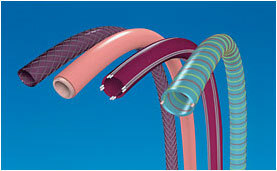 Typical applications include drug and stent delivery catheter shafts, endoscopes, electrophysiology and diagnostic catheters, and neurovascular devices. HPC Medical tubing designs are used extensively in catheters and medical devices for urology, cardiology, neurology, endoscopy, and laparoscopy applications. Customized manufacturing is possible, with inside diameters ranging from .0910” (2.31mm) to .0020” (.0508mm) and wall thickness of .0003” (.008mm) to .007” (.178 mm). You’ll find our tubing used extensively in catheters and medical devices for urology, cardiology, neurology, endoscopy, and laparoscopy applications. HPC Medical products are ideal for applications where thin walls, strength and tight tolerances are necessary. Braided & Spiral: braid, coil, and longitudinally reinforced tubes. Stainless steel, Nitinol, Vectran, Kevlar and Daycron can be used to reinforce the tube structure. The HPC Medical Products proprietary coating process utilizes liquefied medical grade thermoplastics to create unique state-of-the-art polymer tubing and insulated wire products. The most popular resins are listed below; however, we can provide virtually any thermoplastic resin that your application requires. Soft and flexible, Pebax® improves thermal bond ability and flexibility when applied as a topcoat for polyimide. Pebax® polymer is available in different durometers from 72D to 40D. Polyimide is a cross-linked thermoset polymer that is comprised of organic compounds that were originally developed and formulated by DuPont®. Our polyimide tubing is used for medical and electrical applications with inside diameters ranging from .0028 to .091 inches (.0711 to 2.31 mm). Particle composites are used to produce radiopacity, lubricity or significantly improve thermal conductivity. At HPC Medical Products, we have the expertise to deliver the composites you need, such as radiopaque polyimide tubing as well as boron nitride polyimide with more thermal conductivity than standard polyimide properties. Our tungsten-loaded polyimide-tubing product is inherently radiopaque for visibility under X-ray and fluoroscopy. Hybrid tubing, which typically consists of a polyimide base layer with a thermoplastic outer layer, is constructed from both thermoset polyimide and a thermoplastic polymer including: Pebax®, Nylon, or Tecoflex®. Our hybrid tubing is perfect for applications that require diameters of .0080 to .065 inches (.2032 to 1.651 mm) combined with the strength of polyimide as well as the added benefit of flexibility and thermal bonding. Our pure polymer or particle composite tubing can be cut to precise lengths as short as .05 inches, with a length tolerance of plus or minus .005 inches. This process is ideal for lengths between .05 to 5.0 inches. Lengths that are 3.0 inches or less are usually provided in a jar container for easy access and storage. Parts are de-ionized during cutting to reduce static and make for easier handling. Our process is capable of cutting tubing with OD's of .011 inches to .091 inches, for thermocouple caps, electrical insulating sleeves, as well as bundling collars for groups of wires or fibers. Laser ablation, or laser wire stripping, is a non-mechanical and non-chemical method to remove the outer polymer layer or coating from specific locations on a given wire substrate. The result is clean, undamaged wire that has not been damaged by mechanical cutting blades. Or in the case of chemical stripping, eliminates exposing employees to harsh chemicals and eliminates disposal costs. 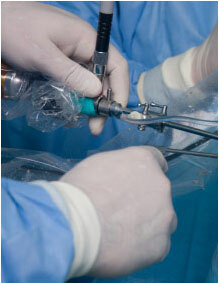 Many medical device applications require material removal to expose an insulated wire’s underlying metal conductor. Due to the small wire diameter requirement in these devices, manual stripping methods are time consuming, unrepeatable, and produce inferior quality compared to an automated laser stripping machine.